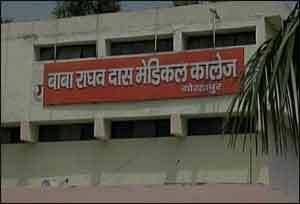 Gorakhpur: A case was registered against the junior doctors of Baba Raghav Das medical college here under charges of assault and loot. According to police, some home guards of a company were in Basti for training. One of the under-training home guards fell sick last Wednesday. He was rushed to BRD medical college for treatment where home guards had a scuffle with junior doctors. Home guards alleged that junior doctors there intentionally delayed the treatment of their colleague. When home guards questioned junior doctors for delaying the treatment, a quarrel erupted. Later, victim home guards reported the matter to the Gulhariya police station and staged protest, demanding quick action against the accused junior doctor. Police have registered a case against junior doctors on Friday under section 323, 504 and 392 of Indian Penal Code. Taking serious note of the matter on Saturday, District Magistrate (DM) Rajeev Rautela has handed over the investigation to Additional City Magistrate Pankaj Srivastava and instructed him to file a report within five days. Home guards have warned police administration that stern actions should be taken against accused junior doctors otherwise they will be bound to boycott upcoming local body elections. Earlier also, an FIR was lodged on unknown junior doctors of BRD medical college for forcefully collecting donations from nearby medical stores four days back.